So, you have a collection that you want to sell all or part of to a buylist. Maybe it’s a collection you picked up off CraigsList, maybe it’s culling down your personal stock, or maybe you’re helping out a friend who found a box of Magic cards in his attic. Whatever the case, you now have to balance two factors that are somewhat at odds with each other: 1) getting through the process as quickly as possible and 2) getting the most amount of money you can. Everyone has his or her own method, and I’m interested in hearing the ways you’ve streamlined the buylisting process in the comments at the end of this article. First, though, we’ll cover some of my favorite tips to help you get your buylisting done as quickly and efficiently as possible. Before we dive in, let’s address the question some of you may be asking: “Why would I buylist my cards? I could get more money selling them on eBay or TCGplayer.” While this is true, listing cards on those sites requires someone to buy your cards, which could take weeks or more. When those cards do eventually sell, it almost certainly won’t be all at the same time, which means you’ll be shipping out far more packages that if you had buylisted. And after all that is done, you still have to pay fees, cutting into that extra profit that seemed so appealing. 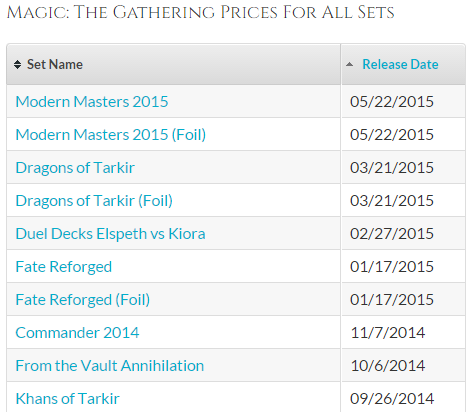 I was opposed to buylists for a long time, but with the advent of aggregated lists like you can find here on MTGPrice, the process became much faster and easier, as well as more profitable. I very rarely list cards for sale these days, instead choosing to send cards on my schedule either through buylisting or PucaTrade. That alone increases my MTG finance efficiency. Now let’s talk about how to improve the efficiency of your buylisting. We’re not going to go over how best to pick a bulk collection in this article. If you’re looking for that sort of thing, Douglas Johnson has covered that topic from numerous angles on this very site, as well as BrainstormBrewery.com. We’re going to assume that you’re starting from a point of having your mythics and rares separated out, with anything that is obviously bulk set aside. The same is true for commons and uncommons that you know (or suspect) may be worth the time to sell individually. For years, I organized my cards by color, because from a player’s standpoint, that’s just the intuitive way to do it. 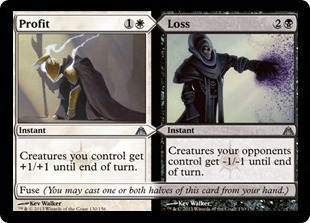 Eventually, I started sorting by color within sets, because when you’re trying to build a deck for a particular format, you want to be sure the cards you’re choosing from are legal. Nowadays I don’t really build any decks at all (I’ve been playing Limited and Cube only basically since my son was born a year ago), so anything I own is either in a trade binder, my cube, or my cube’s on-deck binder. Everything else is sorted in longboxes alphabetically by block. Sorting alphabetically is key. 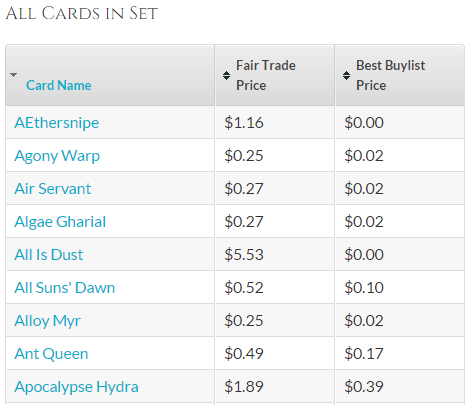 No matter what buylist you’re dealing with, you will have to sort alphabetically—first by sets, then by card names within sets. However, I don’t like to go all the way down to the set level when sorting for a buylist. It just takes a little bit too much time, and it’s not that hard to flip through a block’s worth of cards a few times over when comparing to each set. That said, if you’re dealing with an absolutely huge collection, sorting by set instead of block will probably be more efficient by the end of the process. 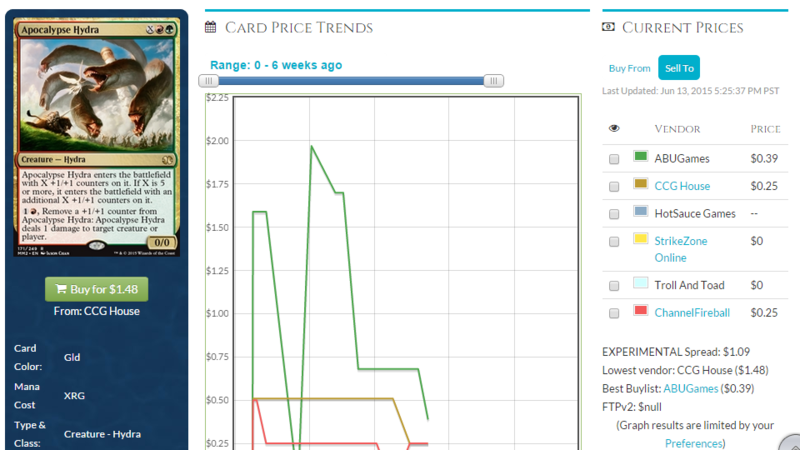 Initially, the cards will be sorted by descending price. Since you’re working from an alphabetized pile, though, you’ll probably want to click “Card Name” to make the list here sort alphabetically. There you go! Now you can compare the pile of cards you’re holding to this list. 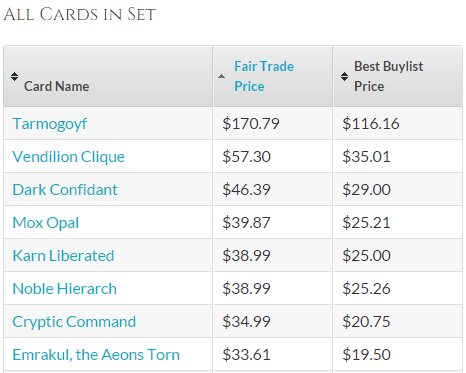 If a buylist price looks acceptable, simply click on the card, click “Sell To” on the left hand of the screen, and note the name of the vendor offering the highest price. So, if you were looking to buylist an Apocalypse Hydra for that tasty 39 cents listed above, you would see that ABUGames was the one offering that price. At this point, I like to take a Post-It note, write “ABUGames” on it, and then start a pile of cards directly on that Post-It. For each new store that I am considering a shipment to, I’ll start a new Post-It note. Some people have playmats specifically for this purpose, but I’m not quite that fancy just yet. If you have a completely unsorted pile of cards, you may find yourself not really wanting to go through and sort everything, especially if it’s a mixed lot with lots of different sets and not too many cards from any one block. 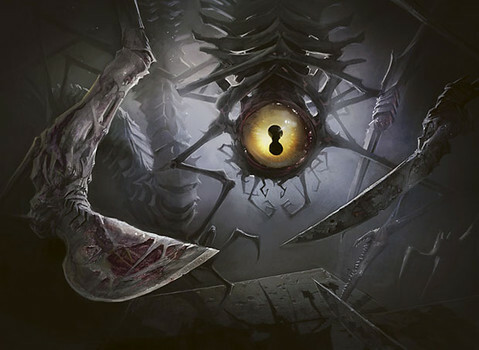 In this case, you can take the slightly more painful method of individually searching for cards by just typing in their names here on MTGPrice. In most cases, it will be less efficient, but there are certainly collections that warrant this approach rather than pre-sorting everything. If your memory is not such that you can remember which pile you put a particular card in, though, you may want to at least sort cards so that that duplicates are together. Otherwise, you’ll end up wasting a lot of time searching for the same card over and over again. How you ship your buylist cards largely depends on how many cards you’re shipping. If you’re doing a quick and easy buylist including a just a few cards (no more than six), you can send them in a plain white envelope with a stamp. However, note that this method will leave you with no proof your cards were actually sent, should you be the paranoid type. Most buylist shipments will include a few more cards than that, though, and if they’ll fit, a bubble mailer is a fine option. You can buy shipping for up to three ounces for $1.93 through PayPal, and that comes with delivery confirmation, too. I like to use team bags with toploaders on the ends for protection. This will ensure your cards are easy to access but well protected. Whenever you’re shipping Magic cards to anybody, including merchants, if you’re taping stuff up, fold over the end of the tape to form a little tab that makes it so the tape can be very easily removed. This is 100 percent a value play for you. Think of it this way: if you were the guy grading cards for a shop and somebody packaged something up in a way that made it really difficult to open, you would probably grade their cards a little more harshly, right? Not to say you would be dishonest in your grading, but you would be less inclined to give somebody a pass on borderline stuff. I want to do everything I can to avoid that. Occasionally, you’ll need to ship a much larger buylist order that couldn’t reasonably fit in a bubble mailer. In these cases, I fill up a regular card box (the of which is size based on the number of cards, of course). To ensure nothing gets damaged in the mail, all empty space should be filled in with folded tissues, cotton balls, packing peanuts, or other soft material that won’t damage your cards. Make sure that when you shake the box, you don’t hear cards banging on the edges. Once you’ve got that done, tape it up very well (those things aren’t fully enclosed to moisture) and ship it out in the box itself. A recent 500-count box I mailed cost just less than $10. That’s kind of a lot for shipping, but presumably you’re getting a nice return on that many cards. Finally, do some research on the vendors you’re considering dealing with. Some have better reputations than others, and it’s important to know what you’re dealing with going in. I won’t do any badmouthing here, but I’ll go ahead and say that I especially find it a pleasure to do business with Card Kingdom and ABUGames. AdventuresOn is fine but I hate buylisting on its website, and ChannelFireball pays quickly on the occasions that you actually like the prices it’s offering. I’ve had good and bad experiences with other stores, but these are names I tend to trust. Each time I prepare a pile of cards for buylisting, I figure something out that helps improve my efficiency the next time around. What are your best tips for improving the buylisting process? I’ll leave you with this one last thing: find something entertaining to listen to while you’re doing all this sorting—a podcast, a TV show, a web series, whatever. This is not very engaging work, but if you want to make money in MTG finance, it’s necessary. Been prepping to clean up some chaff from my collection using the sell my collection now tool and then removing cards I want to keep. Just wish the tool was more easily exportable to work through. Thanks for the article. I wanted to add a couple words about my own experience buylisting. I’m the kind of person who buylists right down to the 5-cent cards. If you’re not this kind of person, I understand – you’ll make more money per hour running a lemonade stand. But if you’re like me and you derive more than purely monetary enjoyment from getting every bit of value out of a collection, then 5 and 10 cent cards start to look pretty good…especially when you have many copies of each card. But when your cards are less than NM condition (and most are not NM when you buy collections) you have to be careful or you risk going through a lot of work only to get 1 cent, zero cents, or even negative cents per card (due to shipping costs). That’s why taking the highest buylist number isn’t always the right move. I also have had the best experience with Card Kingdom, ABU Games, and Channel Fireball. Card Kingdom tends to get about twice as many as the other two whenever I mail out cards, but Channel Fireball and ABU often beat Card Kingdom’s price by a large amount, so never just send everything to one store. But the thing I’ve learned after several frustrating lessons is to never send a common or uncommon card worth 10-cents or less to Channel Fireball…unless it’s pack fresh mint. I don’t mean that their grading is unfair, I mean that their grading POLICY is highly punishing. Any C/U worth less than 10 cents and graded under NM is valued at bulk price…which is 1/8th of a penny. That means – even at the best shipping rate possible (USPS flat-rate medium box) – you are paying more to ship each card than you receive. That’s right – you are PAYING them to take your cards. Card kingdom applies their standard deduction scale to even the lowliest of cards. So that scuffy 5-cent common is still worth at least 3 – 4 cents, which means you never take that great of a risk in sending them hundreds of played cheap cards that can add up to a few bucks. I just wanted to spare others my hard lessons.